When it comes to growing tomatoes at home, you just can’t beat the flavor. We already know that growing your own can save you a lot of money as well. 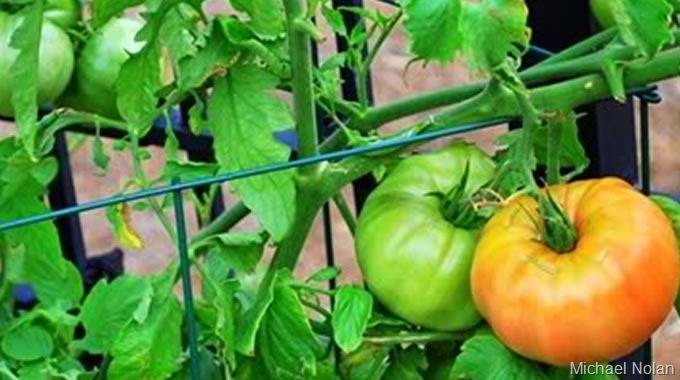 One thing that is different with tomatoes than with many other plants in the urban garden is that as they grow and become heavy with fruit, tomato plants need to be supported to keep the stems from bending and becoming stressed or breaking outright. There are as many different ways to accomplish this as you can imagine, but they generally fall into one of two schools of thought: tomato stakes or tomato cages. Tomato Cages come in all forms, from the simple cylindrical metal frames that are most commonly found in home and garden centers and big box stores to homemade contraptions fashioned from anything from wire fencing to bamboo poles. There are several commercially available cages that range in price quite widely, but a good tomato cage doesn’t have to cost a fortune. In fact, some products that I’ve tried over the years weren’t even good enough to support the plant! Support the weight of the tomato plant. Be strong and sturdy enough to anchor the plant in the event of strong winds or heavy rains. Not impede access to the tomatoes when they are ready for harvest. A simple tomato cage can be built at home with a 4 foot section of strong, heavy gauge rolled wire fencing that is at least 4-5 feet tall. Simply loop the two ends together and connect them by twisting the exposed ends of wire together. If you have access to bamboo poles, you can make tomato cages by tying the poles together with strong cording. Be sure to allow for extra height so that your poles can be sunk into the ground for stability. Tomato Stakes are perhaps much easier to install and they are quite common in larger scale gardening and farming situations. They are, as you might imagine, simply a sturdy wooden, plastic, bamboo or even metal pole inserted into the ground alongside the main stem of the tomato when it is planted. As the plant grows, the stem is tied loosely to the stake for additional support. I do not recommend tomato stakes for beefsteak and other large types of tomatoes. Question…..what insects are good for the garden? I’ve heard Praying Mantis, toads & others are really good for keeping the insect population down. Check out this post for a graphic that shows lots of beneficial insects for the garden. There is a lot of useful information on that poster, and if you have further questions please let us know.